Lucky Tree 2-tire bamboo shoe bench with high and low level is made of 100% bamboo, which is environment friendly, sturdy and durable. The shoe rack two tires side provides enough space for flats or sneakers, one tire side great for boots. With different heights seat, it can allow kids sit on to put on or take off shoes. And this all-purpose rack is also ideal for book, toiletries or plants and you can put it in entryway, bedroom, bathroom, balcony, closet, etc. The natural and smooth finish, rounded corners, protect your family from being scratched, especially the children. With a stylish design, this shoe standing shelf is aesthetically pleasing and functional. Simple color matches with mostly home decor. Why not take one home! 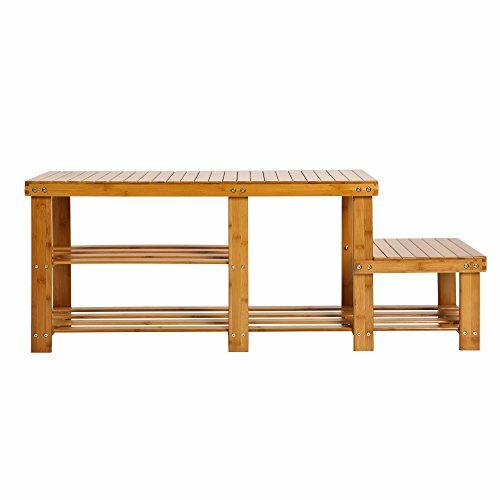 - Height of each tier: 7"+6.7"+14.5"+6.7"
A combination of shoe rack and bench to help you saving space. Use the 2 tiers bamboo rack as a plant stand, a spa bench or any other storage rack to be placed in the hallway, doorway, garage, mud room, living room, bed room, balcony, bathroom,etc.